I've always enjoyed packet tricks, and Paul Hallas is a respected authority on the subject. Born in West Yorkshire, England, he has decades of experience in magic, packet tricks being one of his specialities. He has even written several successful books about them, including "Small But Deadly" (2005) and its larger sequel "Still Small, Still Deadly" (2010). Also be sure to check out his youtube channel (link), where you'll see him perform a variety of packet tricks. I own several of Paul's novelty packet tricks, including The Ultimate Card Trick Collection and The Tree of Knowledge. So I was immediately intrigued when I heard about the re-release of one of his older effects, Hare Raising Hats. This has appeared previously, but Meir Yedid Magic has produced a new printing a few months ago on larger parlor-size cards. The routine plays on an age-old stereotype: the magician pulling a rabbit out of a hat. 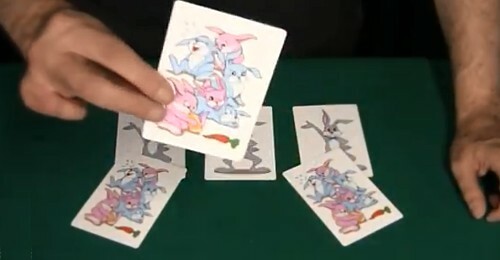 First you show several cards with hats, producing a rabbit from them one at a time. Next, one of four hats disappears. Then as a final surprise, the hats are turned over to show that the backs seen at the start have now changed into images with a large number of baby bunnies. With this product you get six cards, but they are parlor-sized (3” x 4.5”) rather than the usual smaller poker-sized cards. The original version of this effect from 2011 had some Bicycle backed cards (see it performed here). These larger sized cards make it more suitable for performing to a larger group, such as a children's birthday party, and are made from a glossy card-stock with attractive colour-rich pictures. Besides the cards, you also get an instruction sheet which covers everything you need to know in order to learn the routine. Colour photos are included to make it easier to follow along. If Mr Elmsley is already your counting friend, then you already know the sleight needed to perform this routine, and you'll simply have to master the patter (which is included in the instructions) and remember the different phases of the routine. All quite straight forward! A separate section in the instructions explains the Elmsley for those who are unfamiliar with it. There's also some extra tips for experts, offering some possible variations to some of the moves. The cards are excellent quality, and the larger-than-normal size makes them well suited for using in situations where you're performing to a group, such as at a children's party or a restaurant. The subject nature of the routine draws on a classic of magic, so it will speak to all ages, and it's just as suitable for children as it is for adults. The fact that the cards are completely examinable at the end is an extra bonus. Our friend Mr Elmsley does all the work for us, so there aren't really any knuckle-busting moves or sleights required aside from a basic count, and remembering the sequence of the routine. This is a classic trick from Paul Hallas: easy to perform, engaging, and very practical - ideal for the working magician or amateur looking for a novelty effect that is fun to perform. While not the kind of routine that will drop jaws, it will certainly put smiles on peoples faces, without requiring complicated moves on the part of the magician. Easy entertaining - now that's something that as a magician I can appreciate! Where to get it? 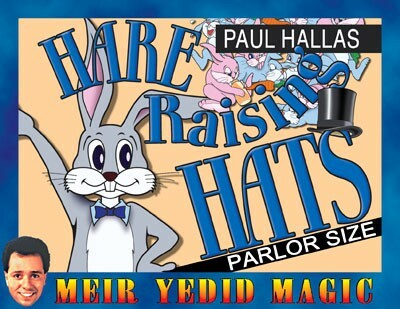 Hare Raising Hats is available from Meir Yedid Magic. Thanks for the review, it's one of my favorites for family groups.